Dimlight was formed back in 2006. From the beginning they played a symphonic Death Metal, which is characterized by aggressive guitar work shrill female vocals and guttural male growls, but only three years later, the debut “Obtenebration” at Emotion Arts Ltd. appeared. Another three years later followed “Psychosynthesis”, which was recorded in their own studio. Guest appearances by Seth Siro Anton (SepticFlesh), Ilianna Tsakiraki (Enemy of Reality, ex-Meden Agan) and Stelios Mavromitis (ex-Astarte, ex-SepticFlesh) enhanced the album. On the tenth anniversary of the Metal Female Voices Fest, the Greeks could present this album. There was a drastic change during the work for the third album “The Lost Chapter” (2015), singer Sanna Salou left the band and was replaced by Eva Fourlanou. In this cast, I was able to experience Dimlight live again, at Metal Over Malta in 2017. And again, there was a change on the mic. The current album “Kingdom Of Horrors” was sung by Mora Hecate. This is the story that tell Dimlight on their album And so the album starts grim and threatening. Peter Miliadis growls deeply and angry. And you hear choruses that sound as if they are not of this world. The instrumentation contributes to this mood. Double bass attacks, low tuned guitars, which sound a bit hectic at times. But there are also bright spots, according to the beguiling voice of singer Mora Hecate. In “Beryl Eyes” you can hear the work of new entry Apostolis, epic orchestration and melody-leading keyboards. The interplay between The Beautiful (Mora’s Plain Song) and the Beast (Peter’s Guttural Growls) are omnipresent. Fortunately, Mora’s vocal style differs significantly from the well-worn Gothic paths. No or little opera singing, her voice is extremely powerful and the middle tone range is clearly her feel-good zone. Also in “We, The Bones” the epic choruses and the great orchestral passages are an essential stylistic device. “Into The Thrice Unknown Darkness”, on the other hand, sounds much calmer melodic. Mora’s enchanting voice is staged by e-piano, strings and a rhythmic drum playing. A great power ballad without any cheesy moments. Epic choirs and bombastic sounds follow again on “Beyond The Gates Of Horror”. 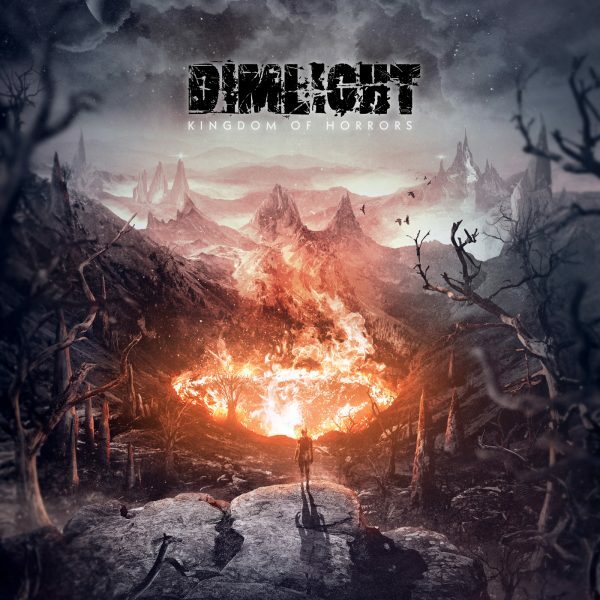 I have to confess, I’m not usually a Death Metal fanatic, even though it’s called “Symphonic.” But what Dimlight deliver here is worthy of all honor. Despite the growls and the fast passages, the songs of the album are highly melodic. That’s exactly what has always impressed me with the Greeks. The vocals, the choruses and the orchestral passages provide musical delights. And with singer Mora, the band has taken a true stroke of luck. I can only recommend this album to any Metal fan.